David and Goliath by Malcolm Gladwell was a book that had a number of interesting stories and ideas that could be pulled from them, but also that seemed to make connections and draw conclusions just a bit too easily. The book covered a lot of territory and a main point from Gladwell seemed to how apparent advantages can actually be disadvantages, and vice versa. Some of the examples of this included ones on school class sizes, attending the best college possible, someone having to endure dyslexia and either losing a parent or simply not having good parental influences while young. The idea of someone (and then those around that person) actually benefiting from an exceedingly difficult childhood was told through the story of Dr. Jay Freireich and his work to try to cure kids with cancer. The hurdles that Freireich had to try to overcome early on gave him what Gladwell described as a disagreeableness that prevented him from simply acquiescing to the status quo of treatment and in essence giving in the large hurdles faced by his patients. Also interesting from Gladwell was some the writing he did around motivation for people and what circumstances caused them to act differently than expected. The phrase used in the book for things that actually would embolden rather than demoralize people was “remote misses” and stories included the German bombing of London and how well the citizens held up during the attacks as well as how blacks fighting for civil rights in the U.S. would often face danger fearlessly. One of the last concepts that Gladwell wrote about was around consequences of actions and limits of power and he told stories about British troops in Northern Ireland, police interaction with potentially criminal New York youth, hiding of Jews in France during WWII, the California three-strikes law and people not becoming consumed by vengeance after a personal tragedy. I've written about and linked to pieces and books from Gladwell many times in the past and have liked his stuff, but going into reading this book have seen quite a bit of criticism of his work as being overly simplistic. Granted, I then read the book with that in mind and after finishing David and Goliath, I’m a bit torn... I think there’s interesting stories to be sure; just I can also see how someone would feel the conclusions are too easily arrived at. Tom Junod noted this in an Esquire review of the book and perhaps Gladwell picking obvious things that he labels as not obvious, and having people feel smart for seeing how obvious they are. 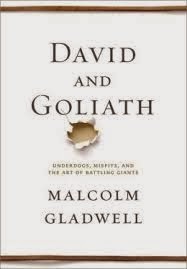 If someone likes Gladwell's work, they'll likely enjoy David and Goliath, just one can't go too far is accepting as fact the conclusions he draws from some pretty fascinating, and I imagine much more intricate stories than are briefly covered in the book.